The American band first snatched the number one position from Cheryl Cole with new single Payphone two weeks ago but was pipped to the post last week by the American rapper's track This Is Love, featuring Eva Simons. The US rockers were locked in an incredibly close three-way battle with Will.i.am and Chris Brown's Don't Wake Me Up but emerged victorious with a lead of 3,000 copies to deny Chris Brown the Official Charts double. Meanwhile, Will.i.am's single has slipped to number three, while Cheryl Cole's Call My Name dropped from number five to 10, according to the Official UK Charts Company. Chris Brown's single climbed from third place to second but he topped the album chart with new entry Fortune. 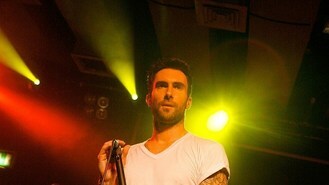 Maroon 5 maintained second place in the album charts with Overexposed, with Linkin Park's Living Things dropping from the top spot to third. Flo Rida held firm at number four with Whistle while London girl group Stooshe, who have been rocking T In The Park this weekend, completed this week's Official Singles Chart top five with Black Heart, climbing three places from number 8. A new entry at number 34 comes courtesy of Britpop band Blur with Under The Westway, one of two new songs Damon Albarn debuted on Twitter on Monday. One place behind at 35 in the singles chart is N-Dubz star Dappy's new track, I'm Coming (Tarzan Part 2). The rapper faced a storm of criticism this week because the film for the single originally contained the message "Free Leo Chindamo" in the opening credits - a reference to the killer of headteacher Philip Lawrence. Chindamo was jailed last year after breaching the terms of his licence and was originally jailed for life with a minimum of 12 years after stabbing Mr Lawrence outside his school in west London.